Continuing my quest to capture peak sports action, I caught a series of photos last night as the West Genesee Wildcats took on the Baldwinsville Bees in high school boys ice hockey. West Genesee Wildcats defensemen goes airborne clearing the puck against the Baldwinsville Bees at the Greater Baldwinsville Ice Arena in Baldwinsville, New York on Tuesday, January 31, 2012. West Genesee won 3-0. Nikon D700/70-200VR, 1/500s, f/2.8, ISO 2200, EV +1.3, 200mm focal length. A teammate’s stick had tripped the West Genesee Wildcats player causing him to go airborne. He still had the presence of mind to continue to shoot the puck out of his team’s zone. While this is something you see all the time in Olympic figure skating competition, hockey players like to keep their skates on the ice. 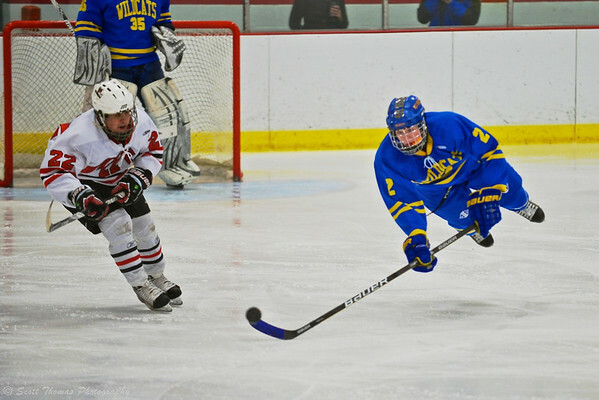 This entry was posted in Sports and tagged airborne, baldwinsville, bees, blue, boys, ice hockey, in the air, new york, players, west genesee, white, wildcats. Bookmark the permalink. What a fantastic shot Scott!!! Wow Scott. I assume you sell photos like that ! I will upload to a gallery to my photo website for players and their families to look over and, if they wish, purchase prints or a downloadable file. There was quite a few of my photos on the posters displayed at Senior Night.